You are here: Home / One Room Challenge / One Room Challenge Week 5 :: Subway Tile, A Sink & A Shelf, Oh My! 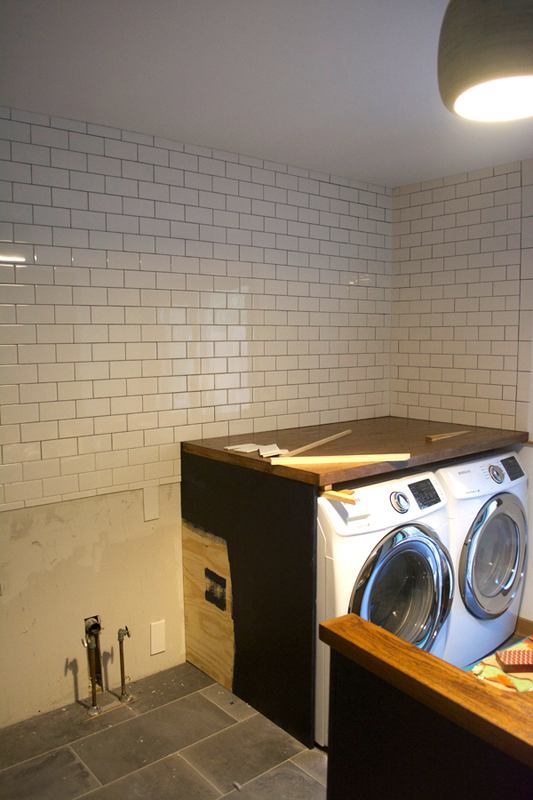 One Room Challenge Week 5 :: Subway Tile, A Sink & A Shelf, Oh My! Ok so last time we chatted, we had a bench, a new light, some cabinets and my wood wall was almost done. 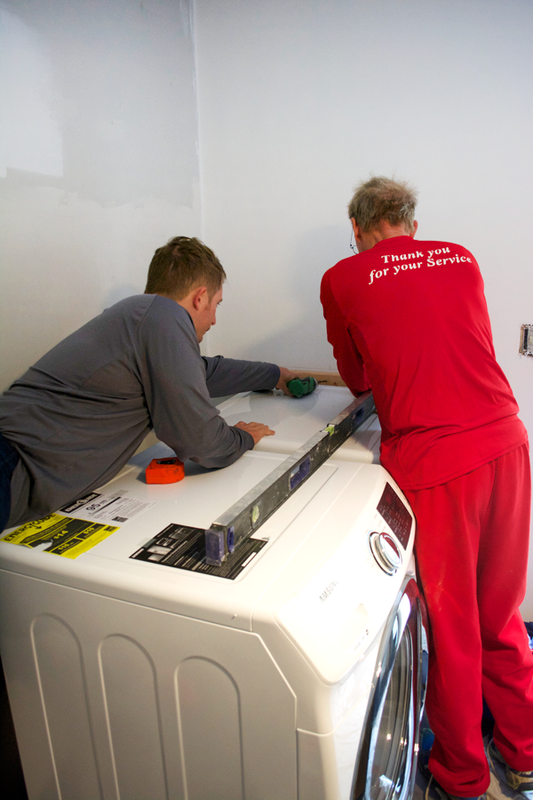 This past week we’ve been busy getting the other wall finished up that the washer and dryer are on. We ended up getting a custom cabinet built for the sink which I’m SO happy with. If you’re local, and are in need of some cabinetry, the guys at Salem Mill & Cabinet Co. are amazing. Bruce and Andrew hooked me up with this gorgeous piece. It’s so well made and even better than what I imagined. I told them I wanted to paint and stain it myself so they left it unfinished for me. I painted the base the same color as the tall cabinets on the other wall (Anchors Aweigh by Sherwin Williams) and stained the top to match our door slab counter top. We have to cut a hole in the back and bottom for the water pipes and then we can install it which we’ll be doing today. For the countertop, we screwed in some supports to hold it up. Once we measured it’s location, we took it off and my FIL tiled the wall. This was before the dark grout. 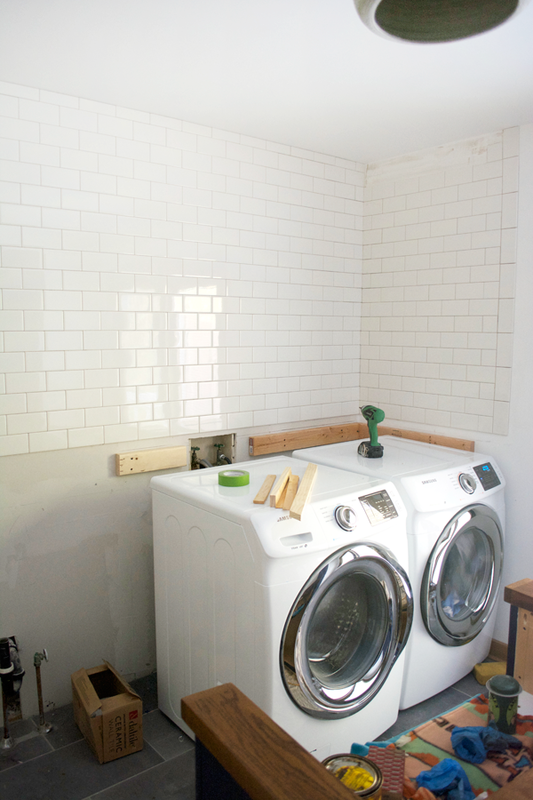 Now centered on this wall above the washer and dryer is going to be a shelf with some fancy hardware from my amazing sponsor Crates & Pallet. 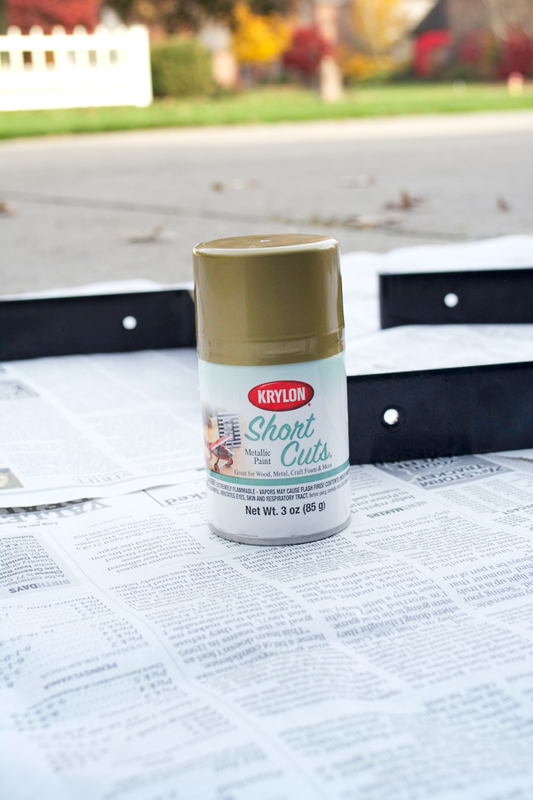 There are some super pricey options out there – especially since I wanted brass ones to match the hardware going on the cabinets, but this was a way cheaper alternative and they’re gorgeous! The shelf just sits right in there and the brackets wraps a bit around the front which I love. 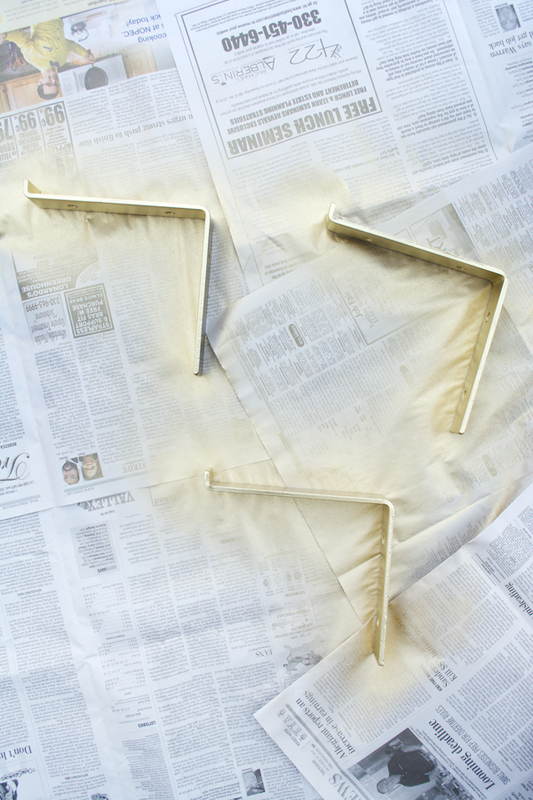 Since I was going for more of a brass color rather than gold – this is the spray paint I used. I bought a piece of wood and stained it up to match everything else and I can’t wait to get this guy hung up! 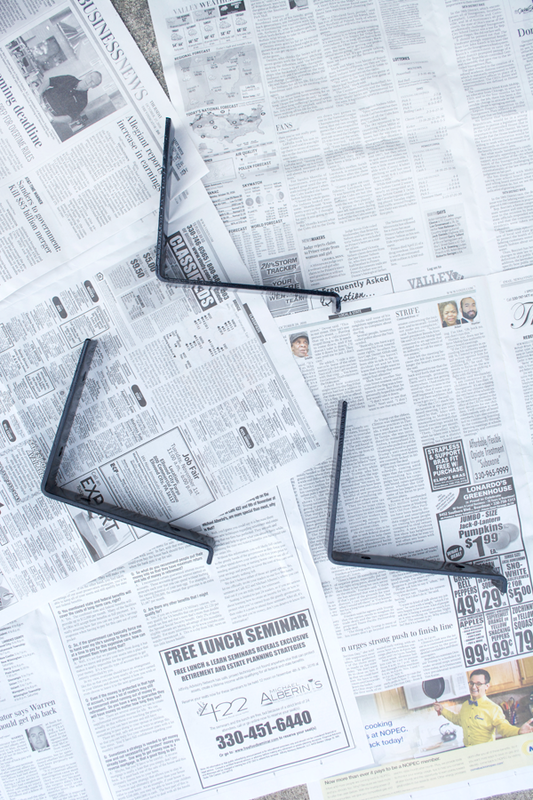 After the reveal, I’ll be sharing a more in depth post about installing the shelf and using these brackets but in the meantime you can purchase them online from the Home Depot HERE. You can also check out all the other awesome products that Crates & Pallet has HERE! 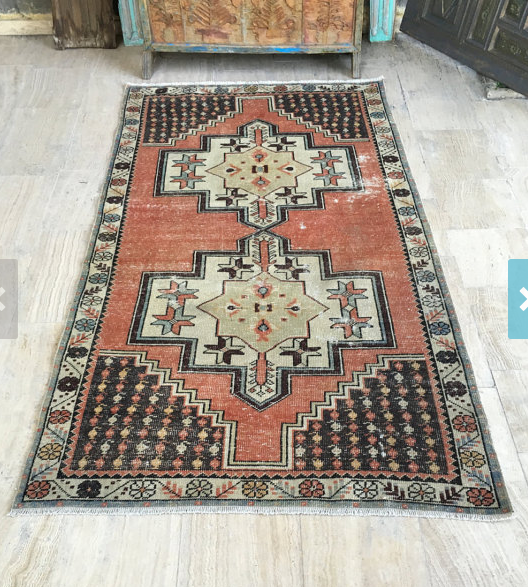 Oh and I ordered this gorgeous rug from Etsy that I’m IN LOVE with. Are you ready for the big reveal next week?! I had a mini panic attack when I thought the hardware I ordered for the cabinets wouldn’t be here in time, but we’re all good now 🙂 Lots of decorating and small details to take care of this weekend and then I’ll finally have the laundry room of my dreams! Let’s take a look at what’s left! 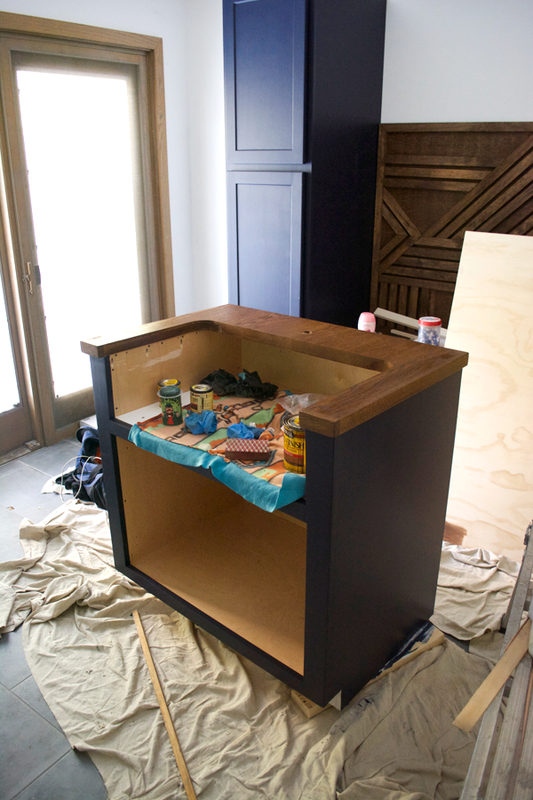 Don’t forget you can follow along over at Calling it Home and see all the other makeovers in progress! 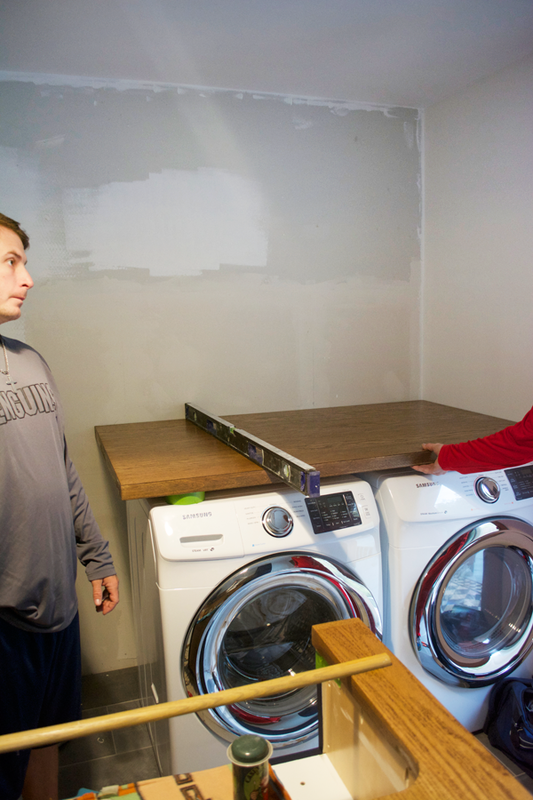 I absolutely love your laundry room!! 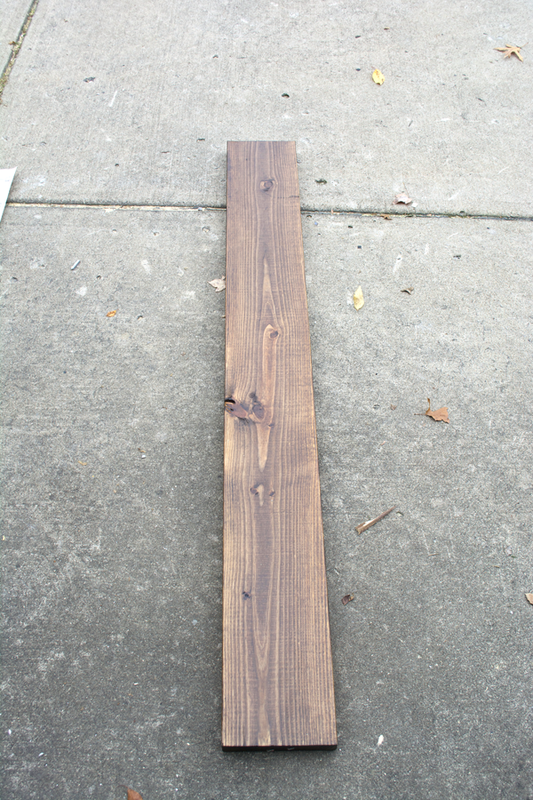 We are doing wood countertops and can’t quite get the stain right but yours is perfect. I see above you said you used dark walnut Minwax. Can you share with me the type of wood you used on the sink countertop? And then if you used a top coat-was it matte? I’m wondering if our combo just isn’t quite right! Thanks!! Hi! Thank you! The wood on top of the sink was Oak I believe and I used a satin poly on top! I was wondering what brand/color of stain you used on your counter and shelf? I’m thinking about doing a navy vanity in our master bathroom with a wood counter. Your color combo is beautiful! The tile is stunning and you KNOW I’m swooning over those gold brackets!! They’re totally your style! Can’t wait to share tonight! Oh my goodness! This is looking sooooo good! Can’t wait for your reveal! I can’t wait to hit publish! Also, what etsty shop did you find that rug at (I clicked on the link, but couldn’t get to it)? Gorgeous, Bre!! I’m drooling over that rug too. :) Can’t wait to see the final reveal! Thanks Tricia!!! Finally finished up last night, now it’s time to photograph! Hope you guys are in the home stretch! I love everything you’re doing in this room, and I can’t wait to see the reveal next week. thank you so much carol! almost time for the reveal! Oh my GOSH. I’m in LOVE with everything you’re doing!!!! It looks SO great! Sidenote: that itsy bitsy spray paint is adorable!! thank you so much heather!! haha isn’t it the cutest?! Your FIL did an great job, Lucky that you got so much help! The blue and white colors go so well together and its my FAv. Thanks maria! I don’t think I would have gotten this all done without him! Bre – this looks amazing!! That tile is to die for!! And I’m going to have to buy those shelf brackets! Can’t wait to see the big reveal next week! Thank you so much Jen!! And you totally should, they’re amazing! I can’t wait to see the rug in the space! The subway tile looks amazing!! The rug looks even better than I imagined it would! Can’t wait to share it all later this week! Ahhh!! It looks amazing!! I love the tile, the cabinets and counters! Nice work, girl! We’re in the home stretch now! Thanks Karrie!! I finally finished everything up last night. Time to photograph today! The rug is stunning! And those brackets are so awesome!! Thanks Amanda!! The rug has totally brought the whole space together! aw thank you so much Ardith!! I’m photographing it today and can’t wait to share it later this week! 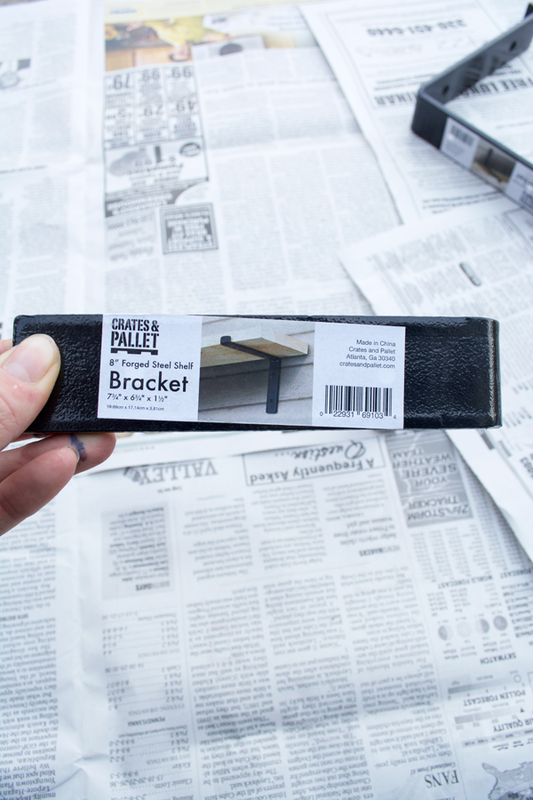 Those are really cool brackets! I love them sprayed gold! Aren’t they great? Such a great alternative to some of the pricier ones out there! It’s looking amazing!! Can’t wait to see! thanks girl!! The end is in sight! I love pretty much everything you do, and this room will be no exception <3 I still think that wood wall art piece is PHENOMENAL!! aw thanks girl!! I can’t wait to finish it up this week! oooh i love the brackets and the shelf! looks so good! everything is looking so good! 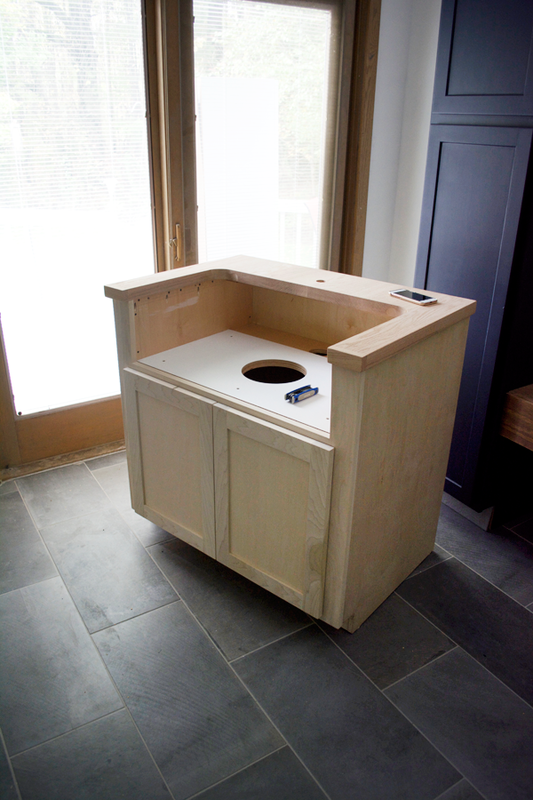 the counter and piece for the sink… amazing! thanks cassie! I can’t wait to get everything installed so I can start decorating! Amazing progress, I can’t wait to see what the final product looks like. That rug will be fabulous! Bre!!!!! Everything is coming together so perfectly! I can’t wait to see the finished space next week! Looking good! Going with a custom built cabinet was the way to go! This room is going to have such a strong finish. The room is really coming along! The subway tile looks amazing and I love that rug! I can’t wait for the rug to get here!